Villa Ventana has everything you are looking for in your next Caribbean vacation. A stunning example of modern architecture, this elegant 3-bedroom villa can comfortably accommodate six people. 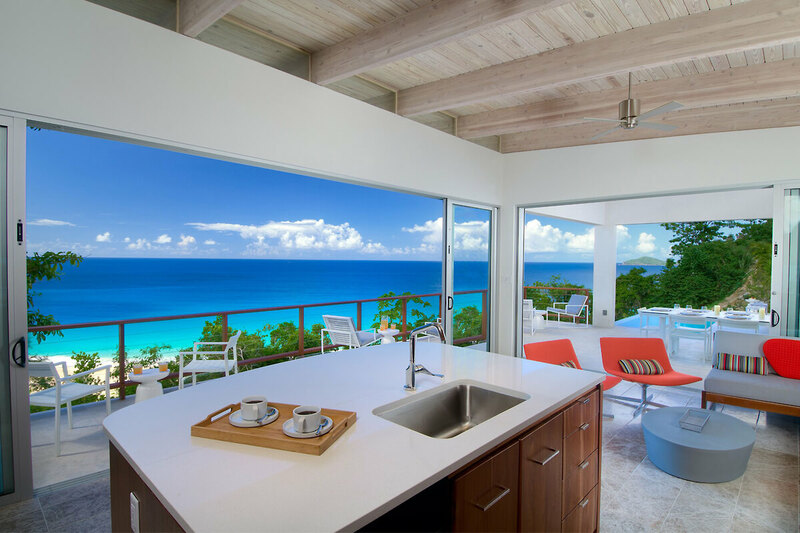 Located amidst lush tropical foliage above the beautiful beach at Trunk Bay, with panoramic views of white sand and turquoise water, you could be forgiven for thinking you were on a Greek island. The aptly named Villa Ventana (Spanish for window) has incorporated clever use of floor-to-ceiling windows in every room, ensuring that the stunning vistas are uninterrupted. Stylish, modern furniture graces the pool area, outdoor dining area and surrounding terraces. The exposed wooden beams and elegant clean lines of the villa add to the contemporary simplicity of this stunning vacation property. Wake up to the sound of the lapping waves below and birdsong from the trees all around. The master bedroom can be found on the main level of the house and a further two bedrooms are reached by an outside staircase down to the lower level. Each bedroom has its own private terrace with comfortable seating and all the usual amenities consistent with a villa of this high standard. Although the beach at Trunk Bay can be reached within a few minutes’ walk by a private path from Villa Ventana, we recommend hiring a car for ease of access to restaurants, shops & the other beautiful beaches of Tortola.